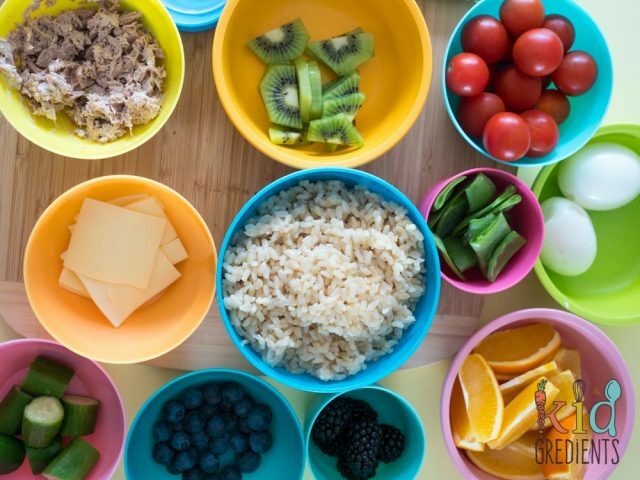 Bento lunches aren’t all about Pinterest perfection, they are about offering a wide selection of healthy options to your kids. Sure, you can cute them up with shaped eggs and vegetables cut into shapes if you have the time and inclination, but it’s not essential. Here, I’ve made a healthy bento lunchbox with brown rice sushi to show you just how easy a bento lunch is. As you can see, this lunchbox packs a healthy food punch! With loads of veggies, cheese, brown rice, tuna, egg for protein and some yummy fruit, there’s something to please everyone – no packaged snacks in sight. Bento lunchboxes help you to ensure your kids are getting everything they need in their lunchbox. They also help as children have small stomachs and prefer to graze all day rather than eat fewer, bigger meals. Offering little selections of each thing mean that kids don’t get bored with eating the same thing. We want to make sure that what our kids are eating at school helps them through the day, so fruits, veggies and a good protein hit are key. Research has proven that children with good diets perform better at school and that foods rich in proteins and omega-3 fatty acids help children concentrate and learn. When making decisions about what to pack in your child’s lunchbox, remember that the fresher and less processed foods are, the better they are for kids. Try to avoid squishy white food as it is low in nutrients and brain fuel. Try to pack as many natural colours as possible in a lunchbox. The more seasonal you can shop, the cheaper your fruit and veggies will be. Making sushi with brown rice means it is better for the kids as it is lower GI. I’ve done this one without sushi seasoning, but feel free to add it if you need the authentic flavour. I find if you reduce the water in the rice when cooking, it will be sticky enough for sushi making. Sushi is best made either in the morning or the night before if you have a lunchbox that seals well. Some other options for sushi fillings that we love are: smoked salmon and cream cheese, leftover chicken and avocado, cucumber and avocado, carrot and leftover teriyaki beef or chicken. Sometimes we even make sushi with leftover healthy fried rice. If your kids aren’t a fan of nori, you can make inside out sushi, where the rice ends up on the outside and therefore the taste of the nori isn’t the first thing for them. 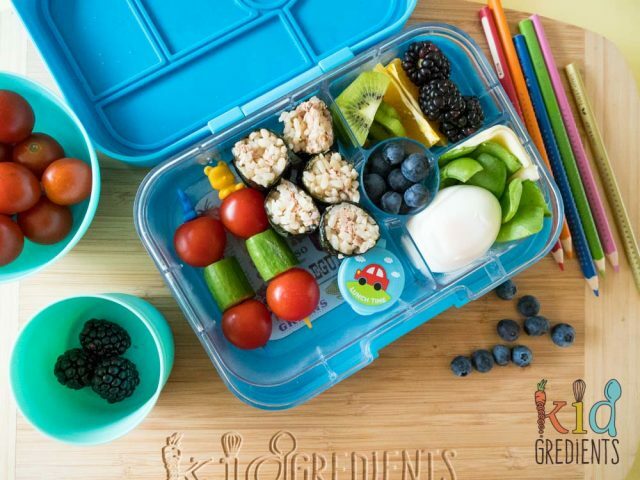 Make the sushi together with your kids for a fun after-school activity. Enjoy! Head here to read more about how you can encourage your child to eat healthy in the home and at school.